Akash Ambani’s Engagement Gets The Finest Out On The Red Carpet - Bold Outline : India's leading Online Lifestyle, Fashion & Travel Magazine. Guess who is the biggest talk of the B-town right now? The Ambanis, and not just for some grand business venture this time. The Ambani and Mehta’s lit pre-engagement bash was held in their South Mumbai’s uber residence, Antilia. Bollywood’s top stars, sports persons and their friends and family brought more spark to the happy celebration. 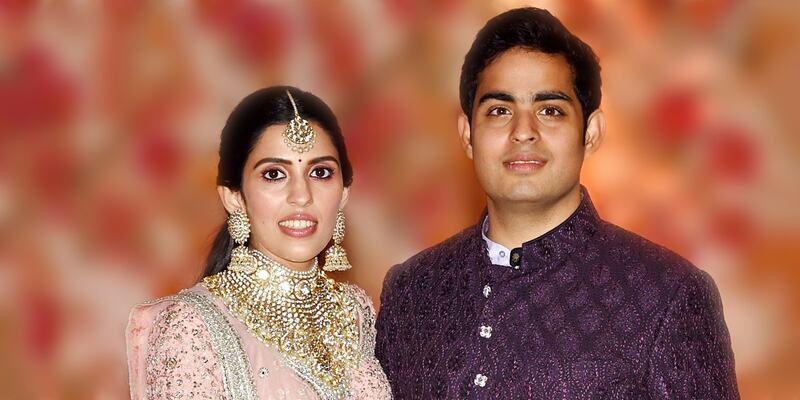 The pre-engagement party of Akash Ambani and Shloka Mehta was a treat to the eyes for three days. The happy couple, Akash (eldest son of Mukesh and Nita Ambani), and Shloka (youngest daughter of Rosy Blue Diamonds owners Mona and Russell Mehta) have known each other since childhood. Shloka Mehta wore a Sabyasachi hand-embroidered lehenga with chiffon appliqués, cut-glass beads and zardozi work. She accessorised it with custom jewellery in uncut diamonds, gold and Japanese baroque pearls from the Sabyasachi Heritage Jewellery Collection. Meanwhile, Nita Ambani with her daughter, Isha, looked pretty in an Abu Jani and Sandeep Khosla creation. Bollywood artists, not to be left behind, arrived dressed to perfection and were seen rocking some desi suits. From Alia Bhatt-Ranbir Kapoor, Gauri-Shah Rukh Khan to Priyanka Chopra-Nick Jonas, Bollywood’s most stylish A-list couples showed their fashion game to the pre-engagement party in Mumbai since Thursday. The pre-engagement party guest list featured quite a few famous faces, including superstar Shah Rukh Khan and wife Gauri Khan. As expected, they all looked stunning. Gauri Khan looked amazing in a dazzling Falguni & Shane Peacock Anarkali. Both SRK and Gauri looked every bit of the power couple they are. This diva wore a classic Abu Jani and Sandeep Khosla saree and paired it up with Amrapali Jewels with beau Nick Jonas on her side. They looked cute when they walked hand in hand! Alia Bhatt wore a saree from the reigning designer, Manish Malhotra with floral motifs and embellished border. Karan Johar meanwhile looked dapper in Manish Malhotra’s emerald green custom-made sherwani designed with the abstract metallic silver floral embroidery art. The Kapoor star arrived in an ivory resham thread embroidery, Matka silk Bundi paired with striped pattern kantha kurta and churidar from Rohit Bal’s collection.